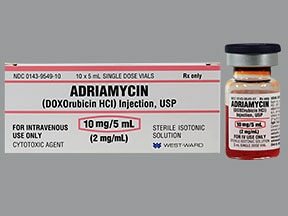 Who should not take Adriamycin 2 Mg/Ml Intravenous Solution? 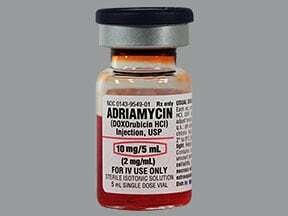 What conditions does Adriamycin 2 Mg/Ml Intravenous Solution treat? Tell your doctor right away if you have any serious side effects, including: cough/hoarseness, persistent diarrhea, redness/flushing of face, eye redness/itching, unusual tiredness, joint pain, pain in the lower back/side/stomach/abdomen, painful/difficult urination, stopped/missed menstrual periods, black/tarry stools, bloody mucus or discharge in stools, fast/irregular heartbeat, shortness of breath, dizziness, swelling of ankles/feet, decreased urination. 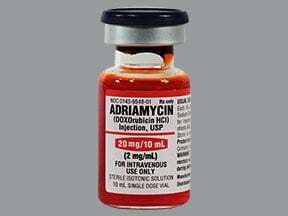 List Adriamycin 2 Mg/Ml Intravenous Solution side effects by likelihood and severity. Before using this medication, tell your doctor or pharmacist your medical history, especially of: a current infection, low blood cell counts (e.g., anemia, neutropenia, thrombocytopenia), gout, heart problems (e.g., recent heart attack, heart failure, irregular heartbeat), a history of receiving any anthracycline-type drug (e.g., doxorubicin, idarubicin, daunorubicin, mitoxantrone), kidney problems, liver disease, severe mouth sores (stomatitis), radiation treatment (especially to the chest area). What should I know regarding pregnancy, nursing and administering Adriamycin 2 Mg/Ml Intravenous Solution to children or the elderly? Some products that may interact with this drug include: digoxin, progesterone, streptozocin, stavudine, trastuzumab, zidovudine. 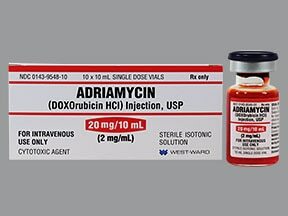 Does Adriamycin 2 Mg/Ml Intravenous Solution interact with other medications? Should I avoid certain foods while taking Adriamycin 2 Mg/Ml Intravenous Solution? 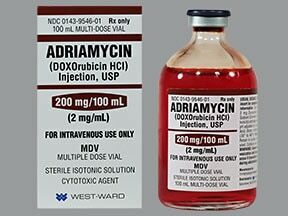 Are you taking Adriamycin 2 Mg/Ml Intravenous Solution? 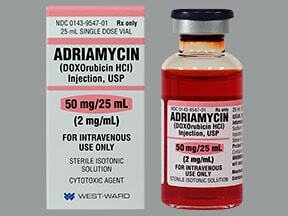 Are you considering switching to Adriamycin 2 Mg/Ml Intravenous Solution? How long have you been taking Adriamycin 2 Mg/Ml Intravenous Solution?